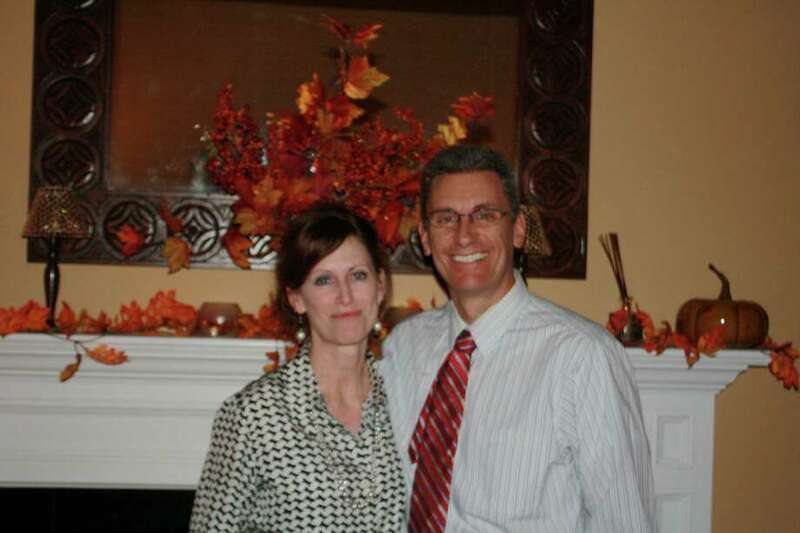 Sandy and Robert Timmons, founders of Lock-Itz LLC. When their son Chris told them that he and his wife were going to bring a lock to San Francisco, Robert and Sandy Timmons never imagined the idea would become a business for them. "He told us he was going to San Francisco on a trip with his wife, and that he was going to bring a lock with him, and we were like -- what?" said Robert Timmons, 49, a math teacher at Middlesex Middle School in Darien, about his son's idea. Sandy Timmons, 51, who works for the IT department at the central office for Darien public schools, said that trip was going to be their last one before Chris' wife would be unable to travel while she was pregnant with twins. Sandy said when they asked Chris where he got the idea, he said, "Oh, I saw it on the Internet. There's this bridge in Paris that you can hang locks on." That was all he had to say, Sandy said, before she and her husband started researching if anyone else was selling a similar product that could be attached to different places around America. Thus, Lock-Itz LLC was born -- engraved locks to commemorate someone or something special in people's lives. "The idea of it is that you lock your love away," Sandy Timmons said. Chris Timmons, who is a computer programmer, created the website, and for a month, the family did a test market to see if people would be interested in buying the product. The website "went live" in May 2011, and since then, they have sold about 800 locks around the world. "It's been steadily growing," Robert Timmons said of the interest. They've sold locks in all but six states in the United States. "I think that the coolest part about the company is that we feel like we're creating love," Sandy Timmons said. "Most people go to places and buy souvenirs to bring home. Well, this is like a souvenir that you're taking to a place and you're leaving your love there, and so that creates another memory." One woman in Los Gatos, Calif., said she was going to start a tradition by putting her lock on one of the bridges. "They didn't know who put the lock there, and now the locks are growing on this bridge," Sandy Timmons said. "We probably get an order from (people in Los Gatos) at least once a week." On average, the locks take about seven to 10 days to complete and ship, and they cost $34.99, $39.99 and $44.99 for the small, medium and large ones, respectively. The locks also come in various colors -- red, black, blue, purple and green. Right now, red is the most popular one sold. What they hope to accomplish, Sandy Timmons said, is for the locks to become kind of a "local tradition." "Rather than just people going abroad, we want people to put locks on places here," she said. They think it's "such a cool idea," and would love to see people start bringing locks to American vacation spots. They said there's a location in Florida where, if you stay at that resort, you can either pre-purchase a lock for when you arrive, or a supply of locks are purchased for clients who want them. Robert said they have a prototype of a new product they plan to release in December, which is a lock with a heart shape on the front. "We want to start marketing it more with weddings and wedding showers, or as gifts to a wedding party," Robert said. They've engraved locks for wedding parties, a veteran, many anniversaries, school symbols and a compass for a traveler. "Pretty much any picture can be engraved on there," Robert Timmons said, adding that what people get engraved on the lock is his favorite part. "We had one lock that said `schmoopies' on it," he said, smiling. Sandy said they hear back from people who buy their locks, and that it's "cool that you're involved in something that's creating love and memories. Not many people can say they have a product that does this."